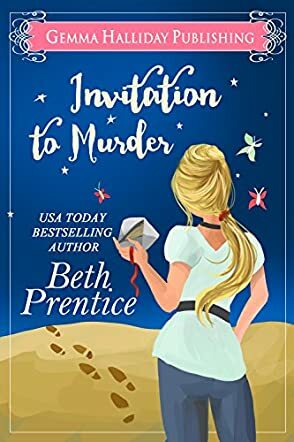 Invitation to Murder by Beth Prentice is a murder mystery story. Alexandra gets an invite to a reunion she doesn’t really want to go to, but she does want to catch up with some of her old mates. The reunion is being held at a television station where she once worked and it has a theme – Murder Mystery. Alex knows she is going to come face to face with her first true love, Jake, who dumped her without a reason, and his new wife, Faith. She isn’t sure how she is going to react, but things may be about to be taken out of her hands. The night of the party sees the biggest storm of the season, a storm that takes out the power and the phone lines, making what follows difficult to deal with. Not only are the teams trying to find a fake murderer, it looks as if they may be on the trail of a real killer, one who looks eerily like Alex. Together with the cute cameraman she never noticed when she worked there, Alex finds herself dead center as a target in a game of cat and mouse. People are going missing, people are dying, and Alex needs to find out what's going on before she’s next. Invitation to Murder by Beth Prentice is an addictive read! What started out as a simple murder mystery party game soon descended into chaos, and Beth Prentice has done a fantastic job here. The story unfolds gradually, giving a reader time to get to know the characters and a bit about their background before the main event and, in my mind, for this book that was essential, because it gave me some insight into what was really happening. When it all kicked off, the story picked up pace and clipped along at a fair rate. There was plenty to get to grips with, lot of action, lots of edge-of your-seat story telling and plenty of suspense. There are several stories unwinding here, but each of them is intertwined in the finale and all are necessary to the whole story. I found this an enjoyable read and ideal for a lazy sunny afternoon.